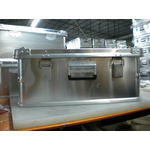 ALUMINIUM TOOL BOX FOR TRUCKS, SUVS, WORKSHOPS, WHICH IS LIGHT, STRONG AND DURABLE. EUROPEAN MARKET TAILORED SIZES AND TYPES, RELIABLE QUALITY. THE BOX IS SAFE FOR TOOLS, MACHINES, PHOTOGRAPHIC EQUIPMENT OR OTHER THINGS YOU WANT TO STORAGE OR TRANSPORT. AS THE MANUFACTURER IN CHINA, WE ARE LOOKING FOR THE CLIENTS FROM EUROPEAN MARKET WHO ARE INTERESTED IN BUYING FROM CHINA.